You could say Rickey Gadson is a two-wheel prodigy. 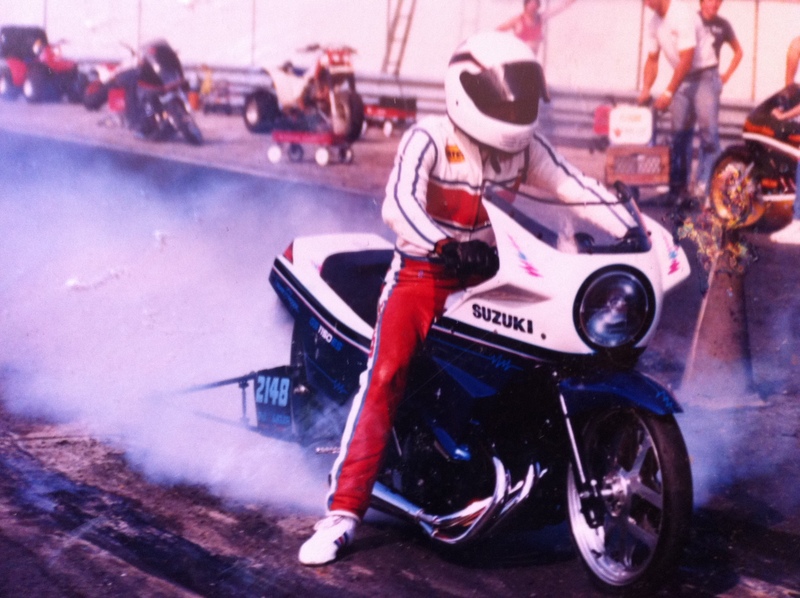 The legendary dragbike pilot starting riding motorcycles at about the same time he learned to walk. At the young age of nine, astoundingly, he could operate a heavy, powerful and massive Kawasaki Z900, even though he could not touch the ground while seated. That was the genesis for what would begin one of the most successful motorcycle drag racing careers off all-time. 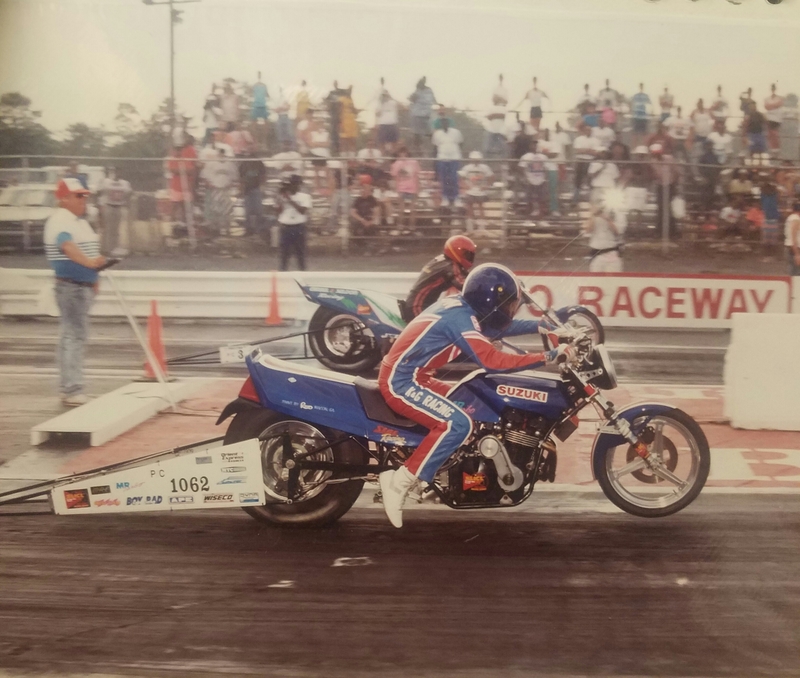 Soon after, Gadson began drag racing in the dirt with a heavily-modified and lowered motorcycle that allowed him to touch the ground. Rickey Gadson, barely able to touch the ground, drag racing in the dirt. “We had to strap the front suspension and the rear suspension, and that is after sliding the forks all the way up. Then we took the seat off,” Gadson said. By the time Gadson reached age 15, he had grown much taller and was ready to explore the popular and exciting street racing scene in his hometown of Philadelphia. Gadson didn’t need his mom’s motorcycle for long. After he proved his extraordinary riding talent he received many offers to ride other bikes. “I don’t know why they trusted me to tell you the truth,” laughed Gadson. On one evening Gadson was given the keys to the latest and greatest at the time, a brand new Suzuki GS 1100 es. It was a dominant motorcycle and Gadson proved unstoppable aboard it. “I beat everybody that night. To the point that the one dude, Shorty, who was a really bad man in the Philly streets started talking trash, saying if he was there I wouldn’t have won, any races” Gadson said. Gadson wasn’t backing down from the challenge. 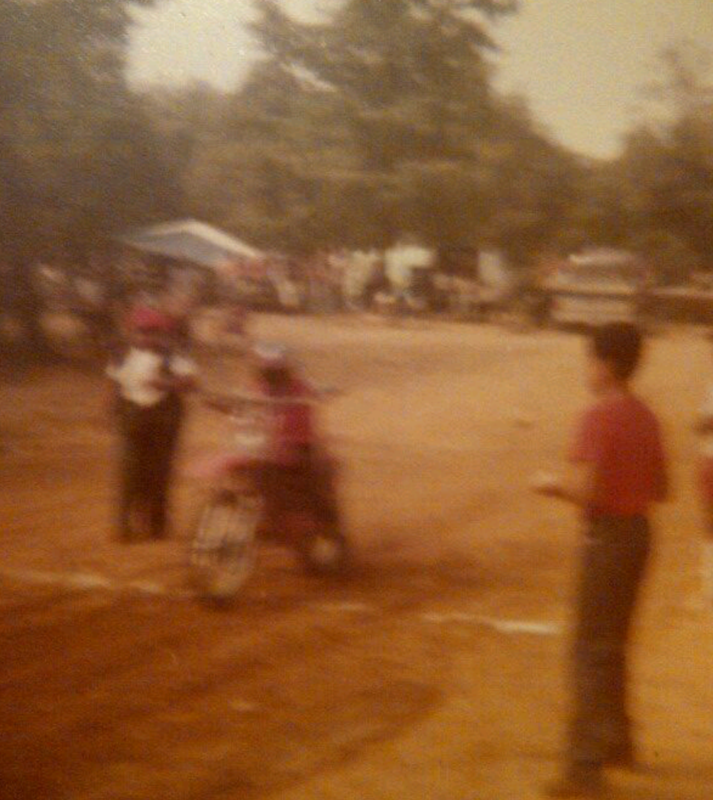 A race was soon setup at Fairmount Park, another spot known for street racing. Shorty too was defeated by this young, up-and-coming jockey. “Ever since then it was on,” laughed Gadson. Unfortunately Gadson’s father passed away in 1979. Gadson knew his father wanted him to continue doing what he loved. Gadson soon set his focus on legitimate drag strip racing. In 1983 Gadson headed to Atco Raceway on his dad’s Kawasaki 1300. “I could barely reach the ground but it was my bike now and I wanted to race. I was running 12.0s,” Gadson said. Gadson quickly got a taste of just how expensive dragbike racing can be. Norristown Honda wanted Gadson to ride a V65 Magna in the NMRA series in 1984. Gadson seized the opportunity and collected a top ten in Super Gas. However the money and excitement of street racing was still too great for Gadson to stay away. Gadson began following around his brother Skip Gadson, Richard’s dad, to all the big street races. Rickey Gadson testing out a heavily modified KZ at Atco Raceway. It was time for a quick lesson. A fully protected, leathered and helmet-donning Gadson lined up against Earl Jarrett in street clothes, wearing nothing on his head but a hat turned backwards. “I couldn’t believe it,” Gadson said of Jarrett’s race gear. It was time for Gadson to learn a tough lesson in the street. Gadson got left on at the start when Jarrett left before the flag man dropped his hands and took the win. “Our people lost about $3,000 that night. My brother grounded me from street racing for about a year,” Gadson said. The mistake didn’t discourage Gadson. It sharpened him and made him hungry. 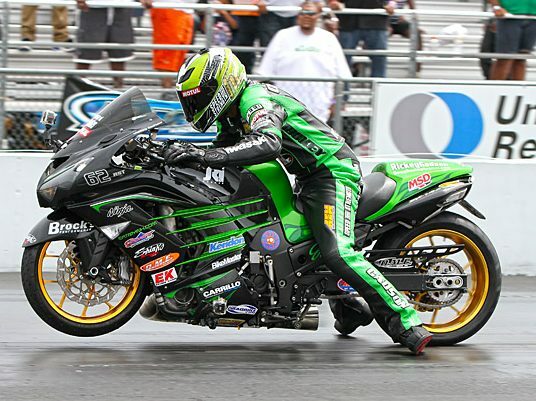 Gadson continued to improve his street racing skills and became one of the best on the East Coast. He would even travel down to Daytona and immediately beat the king, Mike Bruso. 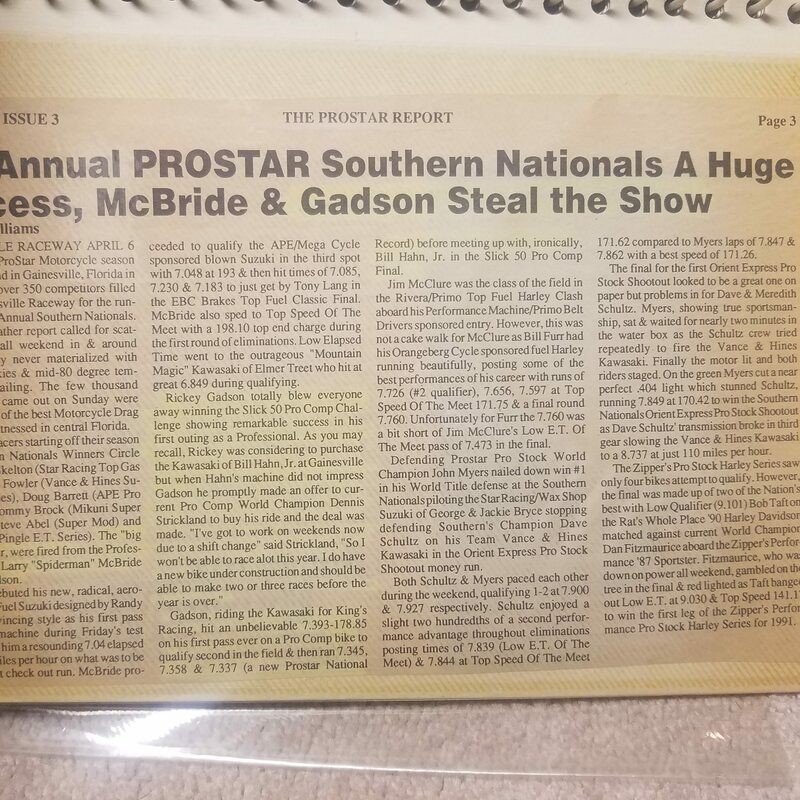 It led to Gadson getting more serious about legitimate drag racing. 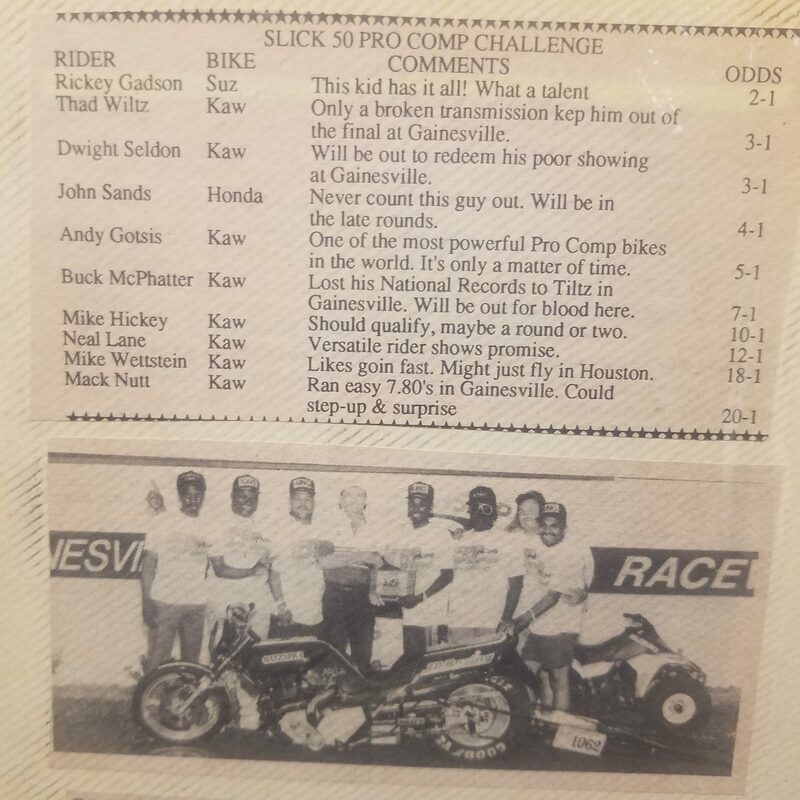 In the 1980’s Gadson was always inspired, motivated and always wanted to be like Jay “Pee Wee” Gleason. Rickey Gadson competing in his early days. 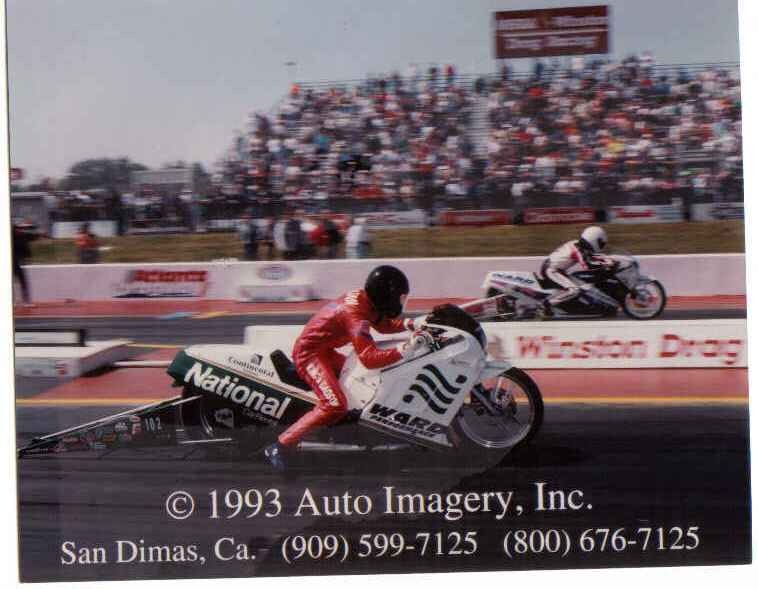 In 1987 Gadson got an opportunity from Brian Drapeau and the legendary Joe Franco to compete in Outlaw Pro Stock. Gadson had the honor of taking on some of the sport’s best including Terry Vance, Bob Carpenter and “Pizza” John Mafaro. 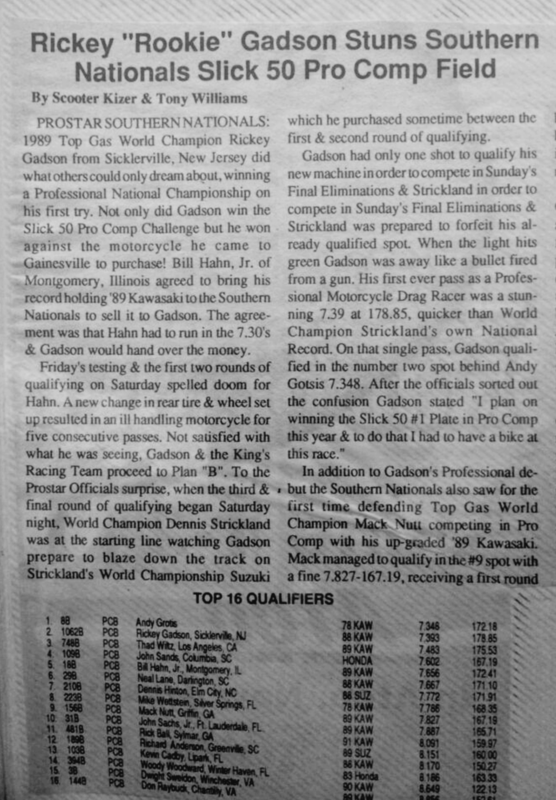 In 1989 Gadson won his first IHRA, soon to become AMA Prostar, championship in Top Gas. In 1991 he took over Dennis Strickland’s former No. 1 plate-holding Pro Comp Suzuki. He won the first four races he entered, broke records and captured a Rookie of the Year honor, Pro Rider of the year and his first professional world championship all in his first season as a pro. It was now time to give NHRA Pro Stock Motorcycle a try. Rickey Gadson aboard a Dave Schultz championship-winning Pro Stock Motorcycle. Gadson’s partner bought the Dave Schultz National Rental Car machine for $50,000 after Schultz won the NHRA championship on it. “Byron Hines gave me about a 20 minute tutorial at Atlanta Dragway in 1993 and I went out and qualified No. 5 and won my first round against Micheal Phillips,” Gadson said. Gadson soon entered the ranks of Pro Mod as well, running 7.17 in Dinwiddie Va., breaking yet another record making him one of the first riders to compete in just about every class – something that is much more common today. The early 90s presented a much different social climate. Gadson said some were not so happy to see an African-American getting so much attention and achieving so much success. 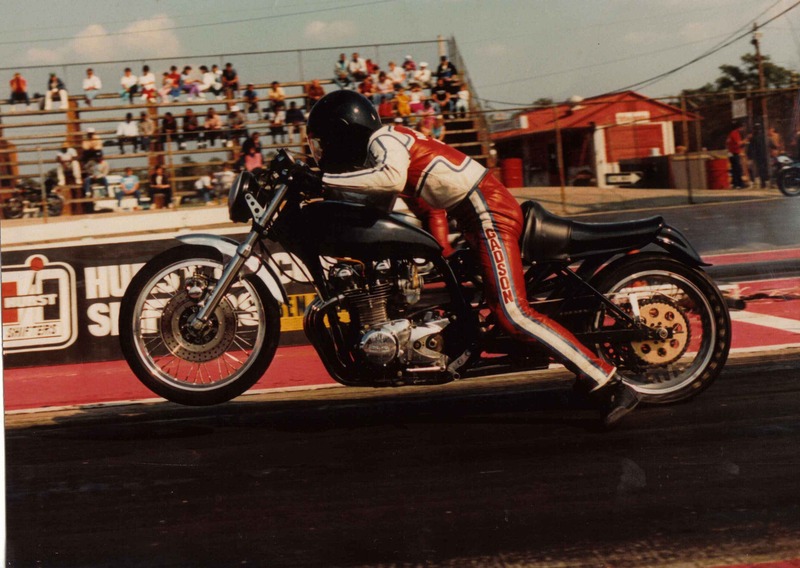 In his early 20’s Gadson was the first man to run 7.20’s in Pro Comp, 7.17 in Pro Mod, and 7.0’s in Funnybike. Gadson was getting plenty of press. “Reggie Showers, Tommy Bolton and Buck McPhatter were the only successful black racers out there. Then I came along and started winning in every class. My whole crew was black, loud and in your face and some people didn’t like it,” Gadson said. The two-wheel community proved to be more accepting than many other social groups. “By the end of 91 everyone liked me,” Gadson said. In 1995 AMA Prostar announced the creation of a 600 Supersport class designed to get factory support. It was the impetus for Gadson’s big break. The class was an instant hit. Even magazine editors came out to race with some of the sport’s best. Rickey Gadson in the early days of 600 Supersport. “It was very interesting. Every street racer who was ever anyone jumped into this class,” Gadson said. Initially no-bar legend Keith Dennis proved to be the man to beat. Gadson recalls running up in the bleachers in Indianapolis to scout his rival. Rice put Gadson in touch with motorcycle racing legend Rob Muzzy and others. They helped Gadson make positive changes to the motorcycle. 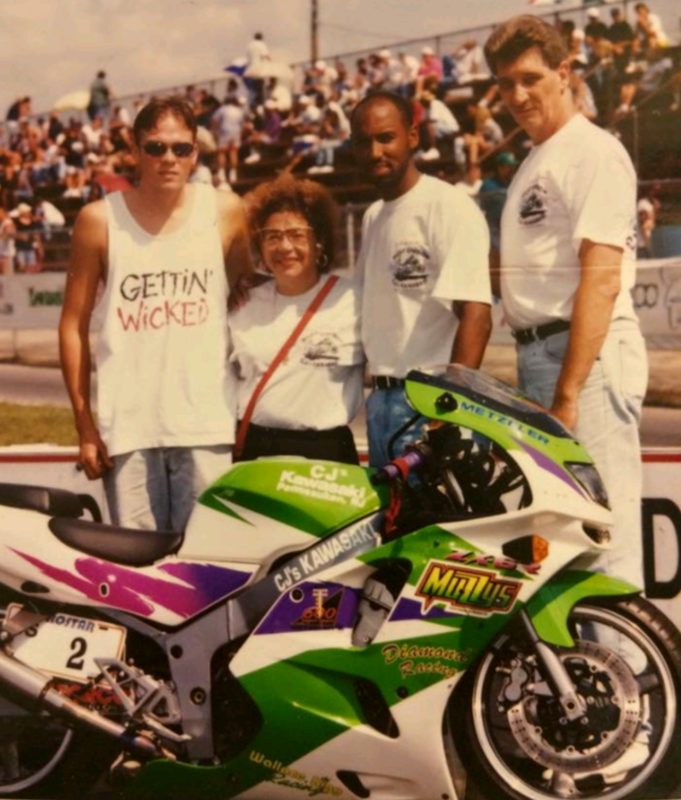 Young Gadson drew from his street racing databank and unveiled the first “Slammed Kawasaki ZX6R” in Bowling Green Kentucky back in 1995 and was the first to lay down sub 10.60 runs recording the record at 10.53 128. The next and last race in Gainesville, Rickey put down the first sub 10.50 et, again setting the record at 10.41 at 131mph and earning the $8,000 bonus for qualifying No. 1 and winning the finals. Gadson didn’t know who he was talking to in the Indianapolis grandstands. It was John Hoover, the head of Kawasaki marketing. 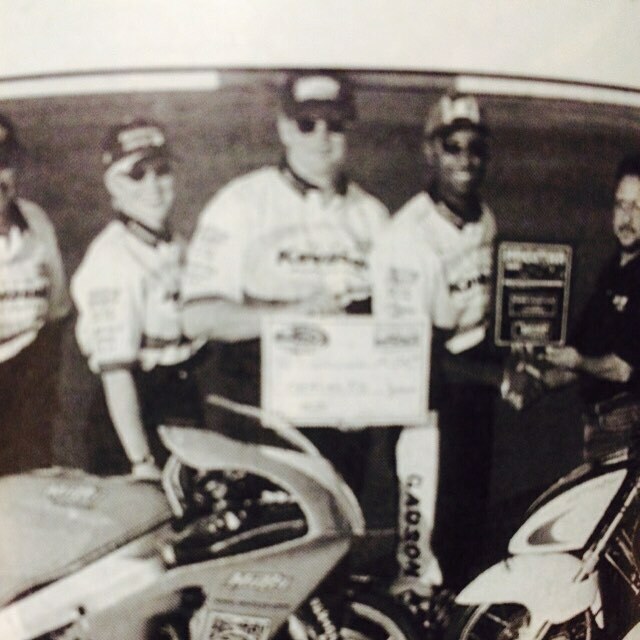 Rickey Gadson and John Hoover in a place they were often – the winner’s circle. 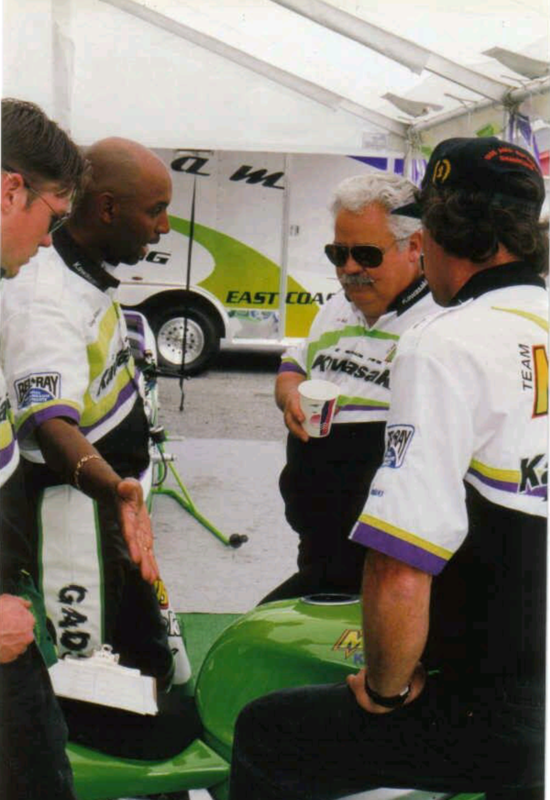 Team Kawasaki’s John Hoover, Rob Muzzy, Rickey Gadson and Bruce Sauer. Hoover bought Gadson his first racing trailer, first set of leathers and put him under the Kawasaki banner even before having a contract. The relationship led to Gadson getting a seat on Rob Muzzy’s 750 Superbike and he immediately won consecutive championships while setting even more records in 1996, 97, and 98. In 1998 Gadson became the first dragbike racer to receive a full-time contract to be a factory racer. Kawasaki gave him $48,000 to join the team. Suddenly Gadson the cable TV installer didn’t have to worry about anything but racing. “It was a dream come true to see a 20-foot-high picture of myself on the side of the green Kawasaki tractor trailer race rig,” Gadson said. Gadson says it was like going from playing street ball to the NBA. “I was the happiest man in the world, point blank, period” Gadson said. Rickey Gadson aboard a Muzzy ZX-12 Streetbike Shootout entry. Gadson would soon discover the downside of success. Gadson also knew representing a respected corporation would require some changes. There was also a choice to be made. 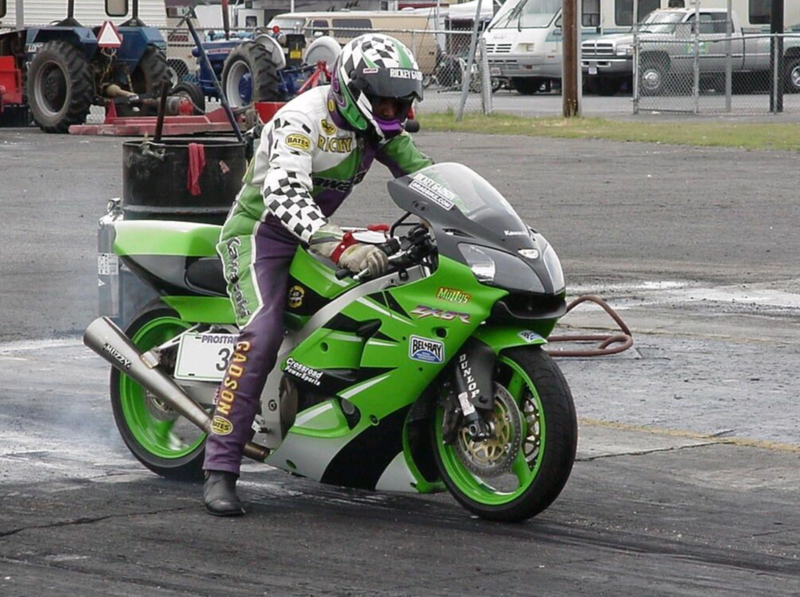 “I made the hard decision in 1996 to stick with Team Green even before signing a contract with them and passed on the opportunity of riding the originally planned two-bike NHRA Pro Stock Motorcycle team of friend and Philadelphia Eagles cornerback Troy Vincent’s Team 23 with Antron Brown, even after teaching Antron how to race a motorcycle at Atco raceway,” Gadson said. 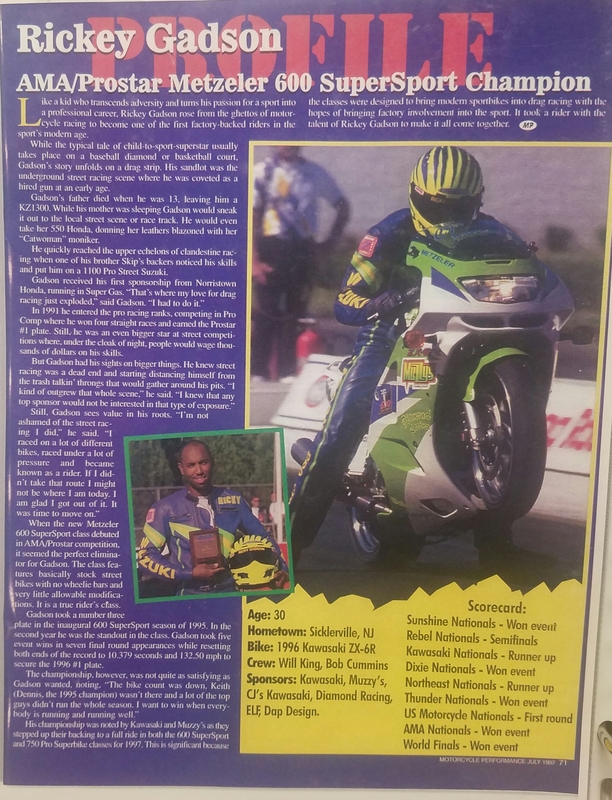 Gadson made the most of his unique opportunity, capturing championships and records in a multitude of classes and garnering arguably more media attention than any motorcycle drag racer before. He is the only motorcycle drag racer to appear on the cover of national magazines not once, but seven times. By 2008 Gadson had reached ambassador status with Kawasaki. The company told him to represent the brand whether he races or not. His new job was to train the media on how to ride Kawasaki’s new flag ship and market the brand any way he saw fit. Rickey Gadson teaching a member of the media how to race. Rickey played a major role in the success of the Kawasaki ZX14 as he was being marketed as the face of the product. In 2014 Gadson was given the biggest honor by being the first civilian to be invited by the president of KHI to come to Japan to consult in the final stages and testing of the worlds first Supercharged Kawasaki Ninja. H2. 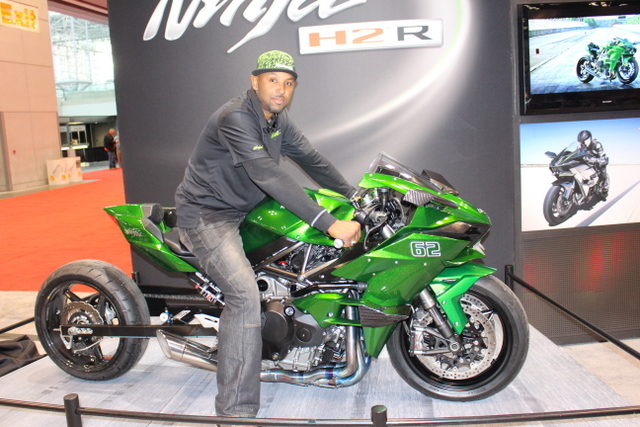 Rickey Gadson on the new Kawasaki H2-R. 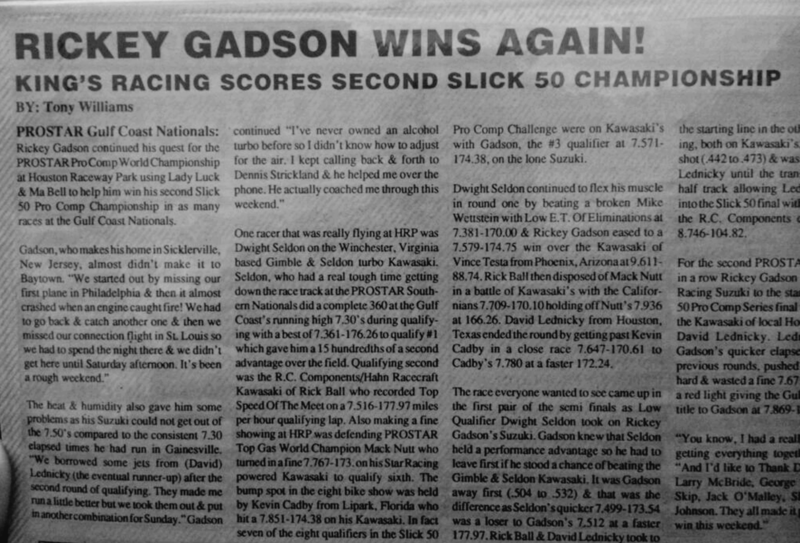 The new verbiage in his deal has not slowed Gadson’s racing career down a bit. In 2016 he was a force at every IDBL race, competing alongside his nephew Richard and winning in every class he competed in. Gadson says he plans to again race IDBL in 2017. Rickey Gadson aboard “Crusher” in the IDBL. “I am pretty much one of the very few racers who has competed every year since 1989″. The media attention has not gone away either. Gadson has been working on the show Caffeine and Octane, airing on Velocity. “I love TV,” Gadson said. “My biggest dream at this point in my career is to be in people’s living rooms every week”. Looking back, Gadson is still amazed at how far he has come on this journey. 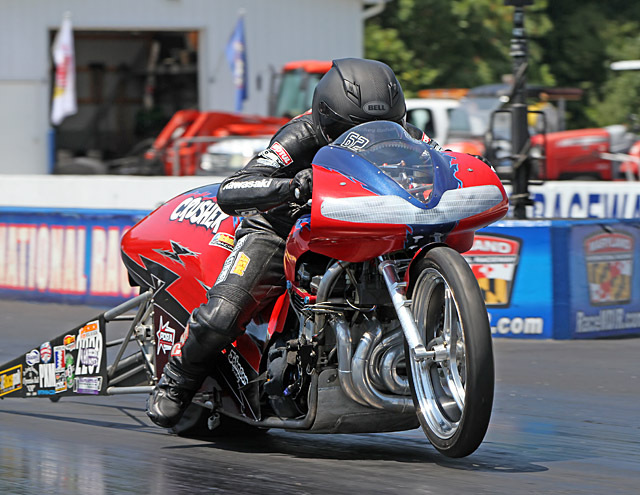 “I want to drag race until I don’t enjoy it anymore,” Gadson said. Clearly the 11-time champ is far from finished. • 2014- Helped engineer and became the face to the new Kawasaki H2R. Also featured in Tucker Rocky’s, Kawasaki’s USA & Speed N Strength’s 2014 catalog books. • Appeared/raced and achieved the fastest time ever on “Cafe racer” style bike Velocity Ch. • The central focus for Kawasaki’s ZERO TO HERO promotional campaign. 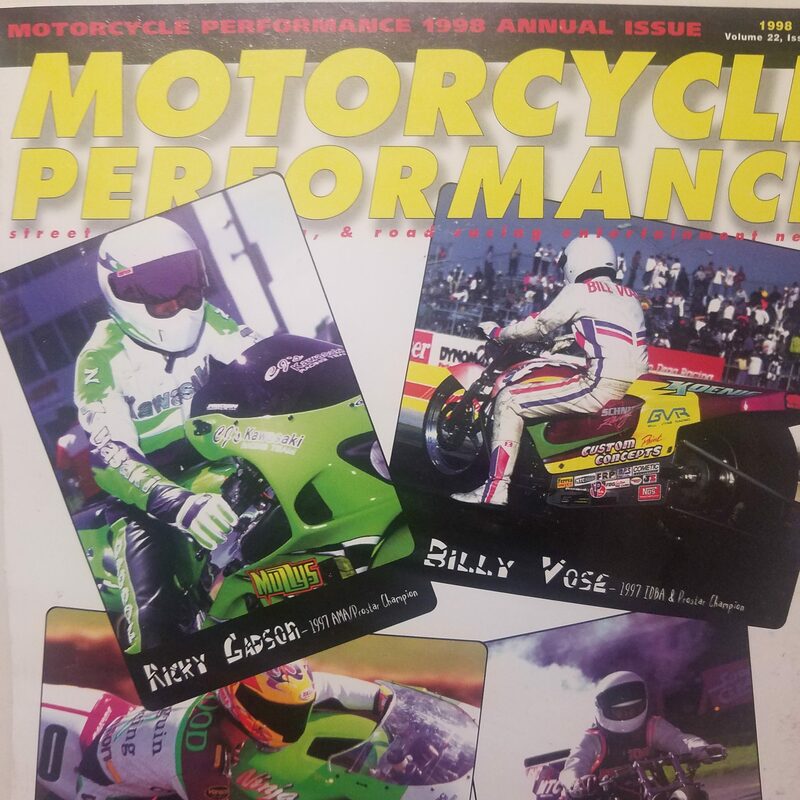 • Rickey appeared on the cover of Motorcyclist magazine as his post the quickest run in history for a production motorcycle. Appeared in Cycle World, Sport Rider and Super Streetbike Magazine. • Speaker at Camp Pendleton and JBAB military base on military safety training days for motorcycles. • 2011 Gadson was the key figure to launch the new 2012 ZX14R in Vegas for Kawasaki and the media. • Rode 700 miles on a sport bike to Myrtle Beach for bike week for pediatric diabetes – appeared on the cover of Cycle world Magazine for running the fastest time ever on a production bike (2011 Kawasaki ZX10R). 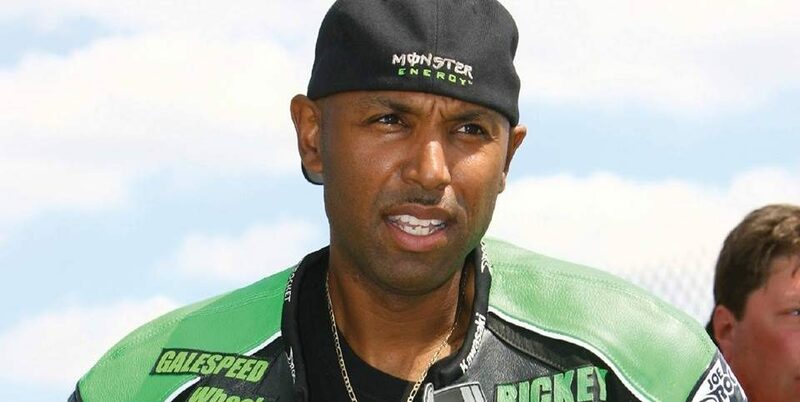 • 2010 Became the fastest African American on 2 wheels when he rode the 254hp on a ZX14 to a Land speed run of 217mph. • 2009 Championship #9-this was the year for Gadson to make his comeback in the Supersport class and prove that his age is timeless. • -Marked the year Gadson became the fastest man to ever race on 2 wheels in South Africa. Rickey TOP FUEL record of 7.52 in front of 20 thousand cheering SA fans. Rickey ran the fastest time ever in Africa at 7.34 310kph. • 2005 Championship #8- went on to dominate the 1000SS Supersport class with 6 of 8 wins and national championship no #8. • -Produced the quickest and fastest time of any bike built on “American Choppers” TV show on Discovery Channel. • – Made the cover of Cycle World Magazine (produced the first 9 second run on a production 600cc motorcycle). 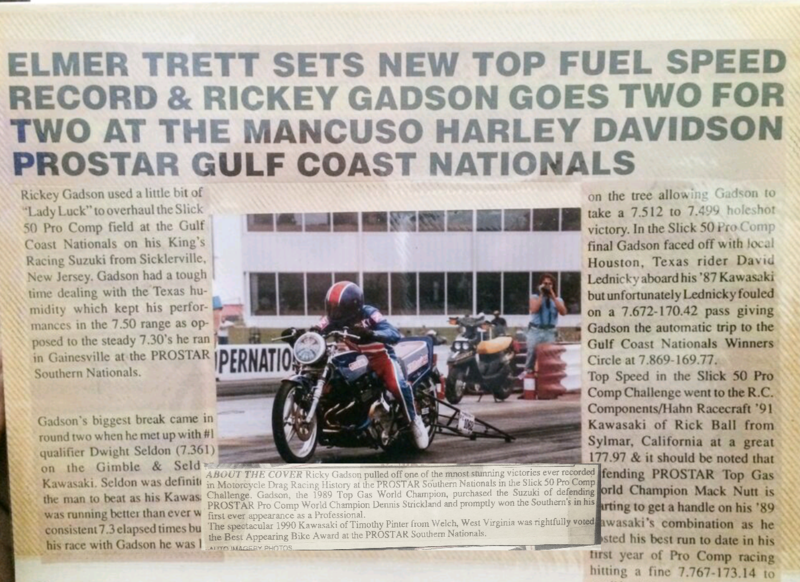 My dad Billy Streater; always said Ricky was raised on bike.I loved reading this story. Best wishes to him and his family.